To avoid late cancellation or No Show charges, cancellation and modification notifications MUST be received by us no later than 3 days (72 hours) prior to arrival date. A valid credit card is required to reserve all bookings and may be used as security against your stay in our accommodation and key bond. A valid International Passport and credit card is also required to validate your stay on arrival. Notice of cancellation is required no later than 3 days (72 hours) prior to check in date. If you do not notify in sufficient time a charge equal to the first night stay will still be payable. Should you wish to shorten a reservation after arrival the cost of the entire stay may still be payable. Charges are at the discretion of management. Alcohol can be consumed in moderation in the common areas guest lounges and kitchen/dining room only. Alcohol must NOT be consumed in guest room or bathrooms. Guests causing a disturbance to other guests or staff will have their reservation terminated without a refund. 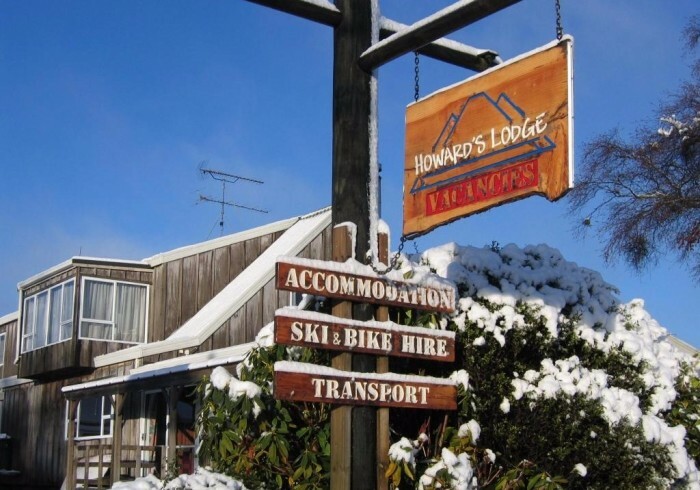 Howards Mountain Lodge is one of National Parks most iconic accommodation providers. With our proximity to the Tongariro National Park and Ruapehu ski facilities, we can cater for all recreational guests. We boast 2 well stocked communal kitchens with ALL the cooking gear you need. We also have 2 large comfy lounges with large screen TV, Pool Table and of course, a roaring fire for those cool alpine nights! Howards Lodge offers a broad variety of accommodation ranging from dorm beds to private ensuite rooms. Daily transport to the Tongariro Alpine Crossing and the 42 Traverse Mountain bike track can be booked at our activities desk. We also offer rental of ski equipment, tramping boots and walking poles. Enjoy a fantastic summer experience or an exhilarating winter getaway. We have just what you need to experience New Zealand at its best.